We all made and played with aerodynamics and flight using paper planes when growing up. These days, there's a more sophisticated way to get the same simple enjoyment out of the art of controlling flight — and it's as perfect to enjoy as an adult as it is to share with your kids or nephews and nieces. This PowerUp X FPV Video Paper Airplane Kit lets you assemble your own plane, and see what it sees in real time via a live video feed. 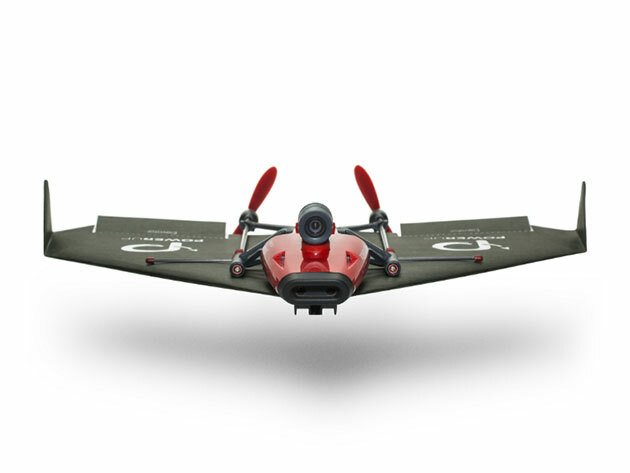 Made out of a light but sturdy carbon fiber polypropylene frame and a crash-proof bumper, you can quickly and easily build your plane, and even experience the power of flight with a live Wi-Fi video feed sent directly to your phone. You can capture an amazing feed from any angle with the swiveling, wide-angle VGA camera. Even if you're a newbie to plane construction, you're guaranteed to get airborne faster with the auto take-off function, and you can fly with more ease even in windy conditions thanks to the self-stabilization feature. You can zoom around at 20mph without worrying about crashing with the auto-navigation feature, seeing what it sees as you play pilot. Take to the skies with this paper plane upgrade: usually this PowerUp X FPV Video Paper Airplane Kit is $139.99, but you can get it now for $104.99.